It's the final round and we're doing things a little bit different. You won't be able to see the scores until the grand announcement on Friday. Make sure you tune into our Facebook LIVE on Friday at 5:30 p.m. FINAL ROUND: Wicked Barley and Aardwolf Brewing Co.
Vote from 4/8 to 4/12. You can vote daily using this link on desktop and mobile. Does your favorite brewery have what it takes? It will be a battle of the brews in the inaugural First Coast Breweries Bracket Challenge. 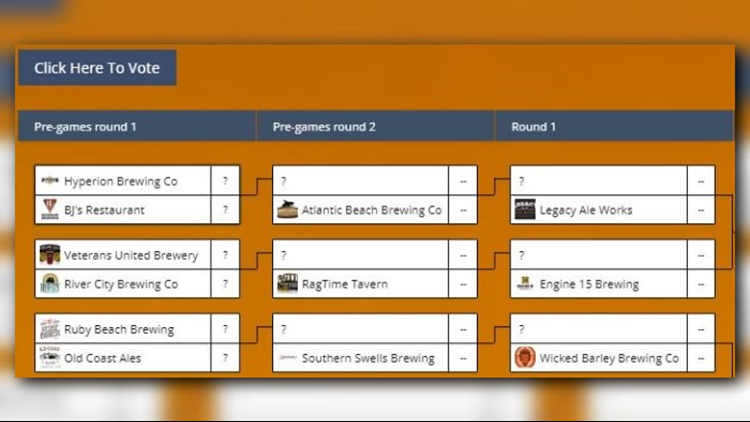 Presented by First Coast Brews, this bracket challenge has squared up 31 of your favorite breweries against each other in a brewery competition to end all brewery competitions. There will be tears. There will be smiles. There will be a series of six rounds of voting starting Monday at midnight. Each round will run from Monday at 12:00 a.m. to Sunday at 11:59 p.m. Round #1 - March 4 – 10. Round #2 - March 11 – 17. Round #3 - March 18 – 24. Round #4 - March 25 – 31. Round #5 - April 1 – 7. The final round will be a bit different as it will be shorter than all the other weeks, Monday, April 8 - Friday, April 12. On that Friday, voting will end at 5 p.m. with a winner to be announced that evening at a special First Coast Brews announcement party. Sound fun? We sure hope so! Vote early and often for your favorite brewery and share the link to help rally votes. Follow First Coast Brews on Facebook, Twitter and Instagram to stay up to date about the latest scores and bracket updates.